General James continued his unbeaten second-up and mile record with an impressive victory at Cranbourne on Sunday. The progressive Savabeel gelding has now won all three of his starts second-up and all three of his runs at 1600m after taking out the Cranbourne Hyundai Handicap on the Cranbourne Cup program. General James, who landed some big bets as he was backed from $41 into $10, was ridden a treat by James Winks, who tracked Darren Weir's short-price favourite, Lucky Paddy, everywhere before coming out of his slipstream in the straight and launching late for the impressive victory. Winks said he was very impressed with the win as he felt the horse has further improvement in him. "He's not fully there in the coat yet, but I really loved the way he found the line when I asked inside the final furlong. He has got a great future," Winks said. 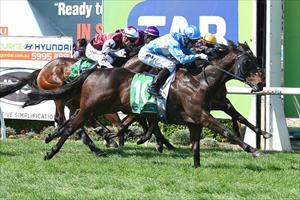 The win was the horse's third from 10 career starts and took his prizemoney beyond $50,000.